Explanation: Stephan's Quintet is a picturesque but clearly troubled grouping of galaxies about 300 million light-years away toward the high-flying constellation Pegasus. 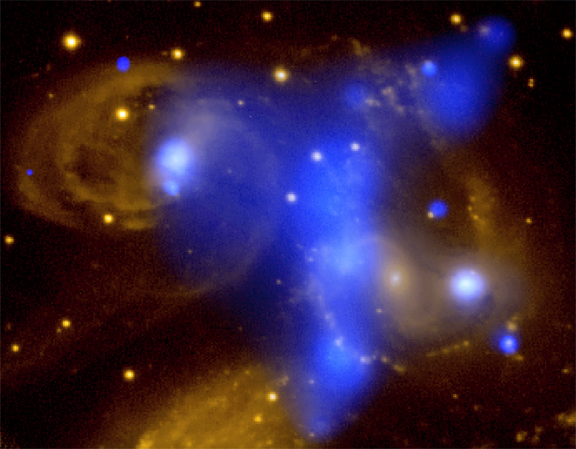 Spanning over 200,000 light-years at that distance, this composite false-color image illustrates the powerful nature of this multiple galaxy collision, showing x-ray data from the Chandra Observatory in blue superposed on optical data in yellow. The x-rays from the central blue cloud running vertically through the image are produced by gas heated to millions of degrees by an energetic shock on a cosmic scale. The shock was likely the result of the interstellar gas in the large spiral galaxy, seen immediately to the right of the cloud, colliding with the quintet's tenuous intergalactic gas as this galaxy plunged through group's central regions. In fact, over billions of years, repeated passages of the group galaxies through the hot intergalactic gas should progressively strip them of their own star forming material. In this view, the large spiral galaxy just seen peeking above the bottom edge is an unrelated foreground galaxy a mere 35 million light-years distant.